During my time here at the Cockrell Butterfly Center, I’ve bred and raised several different types of insects, walking sticks, katydids, grasshoppers, mantids, and even some spiders. These insects are relatively easy to breed and have a quick lifespan. I’ve always wanted to delve into the world of breeding beetles, but for some reason, I’ve been hesitant to take on such a task. Maybe because of the commitment; some species of beetles can take years to reach adulthood! Well, I’ve taken the dive! On Tuesday, September 7, I received a shipment from a wonderful colleague of mine at the Sophia Sachs Butterfly House in St. Louis, Mark Deering. Mark has been raising beetles for years and seemed like the perfect mentor for me. 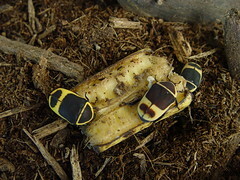 He sent me two small colonies of beetles, one of Eudicella euthalia and one of Pachnoda marginata. These are two types of flower beetles from Africa. Flower beetles are a group of scarab beetles that visit flowers to collect pollen and nectar. Among the 4000 species of flower beetles are some of the most beautiful beetles in the world! Luckily, these two species are excellent for beginners, taking only 7-10 months to complete their life-cycle. The genus Eudicella is comprised of more than 20 species of brightly colored beetles. These beetles are only found in tropical Africa. They are often referred to as “buffalo beetles” due to the “y” shaped horn found on the male’s head. The females’ head is shaped sort of like a shovel and used to dig into the substrate and lay her eggs. Beetles in the genus Pachnoda are also indigenous to Africa, and members of their 108 species groups can be found all over the continent. Pachnoda marginata is the most commonly bred species. 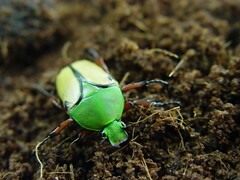 They are also known as sun beetles or taxicab beetles because of their unique color pattern. The male lacks any sort of distinguishing characteristic such as a horn, so I really can’t tell male and female apart! Setting these beetles up for rearing was pretty easy and now all I need to do is wait. 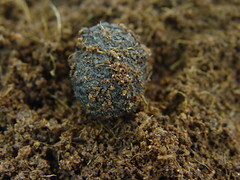 The larvae of both species thrive in a substrate made from hardwood mulch and humus or decomposed organic material. They will feed on this mixture for several months until the time comes for them to change. If you didn’t know, beetles have complete metamorphosis just like butterflies. The larvae of scarab beetles are commonly called grubs and are fat, white, and shaped like a “c”. 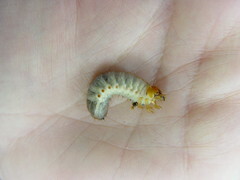 Most of you are probably familiar with grubs since they are often found in your lawn or garden. Once the grubs are ready to pupate, they will construct a cell from compacted dirt and saliva. This cell acts as a cocoon inside which the grub turns into a pupa. A few months later the adult beetle emerges. It really is an amazing transformation and even as an entomologist, it’s hard for me to wrap my brain around that! Being able to rear these beetles here is a great advantage for us. Sometimes exotic beetles are hard to come by or they don’t make the long trip from our only supplier in Malaysia. I’m so excited to have these beautiful beetles here for display and education! Be sure to stop by the Entomology Hall here at the Cockrell Butterfly Center to see these and other spectacular beetles on display! Happy Bug Watching! GREAT article! I want to hear more. Thanks for posting. Thank you Laurel! I’m glad you enjoyed the article! Thank you for the sweet comment! I really need to blog more as I haven’t had time over the last couple of years and a lot of people seem to enjoy them. As far as other similar blogs, I’m not too sure what else is out there, but you can look for blogs by other science museums!